Goat milk solids* (43%), lactose (purified from cows' milk), vegetable oils, acidity regulator (citric acid and/or calcium hydroxide), choline chloride, L-tryptophan, emulsifier (sunflower lecithin), L-isoleucine, taurine, L-carnitine. 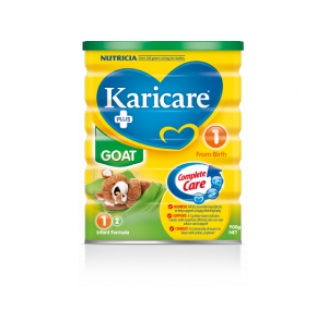 *Goats' milk is a 'characterising ingredient' in this product. Use only the enclosed scoop. Fill scoop lightly; level off using built-in leveller. Avoid compacting powder. Always add one level scoop of powder for each 50mL of water. Cap the bottle and shake briskly to dissolve the powder.